The distinct appearance of black or brown spots on a white coat make Dalmatians easily distinguishable from other breeds. 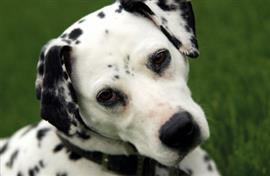 This look is also the source of many typical Dalmatian names like Checkers, Oreo, and Domino. Dalmatians are commonly associated with Firefighting. This association originated when fire engines were moved by horses. The Dalmatian’s job was to nip at the heels of the horses to keep them moving. While their practical use as a fire dog has been replaced by mechanical parts, the breed remains as the mascot to many fire departments. For this reason, names related to fire and extinguishing are popular choices. Chief, Arson, Hazard, and Vollie are few options that fit this bill. Another common Dalmatian affiliation is with beer. The Budweiser beer wagon is typically shown to be carried by a team of Clydesdale’s that is accompanied by a Dalmatian. The breed was once utilized by brewers to protect the wagon during deliveries. Some favored names related to Budweiser and beer in general include Abbey, Bud, Barley, Hops, Rocky, Orval, Mash, and Porter. Some of our pages will contain a subcategory. A subcategory is a slightly more specific grouping than the main topic of the page. For a subcategory, we will include a separated table of names and corresponding descriptions. An example of a subcategory of Red Dog Names would be 'Dog Names Inspired by Red Wines'. If you have any subcategory ideas for the Dalmatian Names page, we would love to hear them. Use the form below to submit your ideas.